A shot of jazz great Anthony Braxton playing contrabass sax. If you like avant garde jazz, there's a good chance you'll enjoy him. The contrabass sax must be one of the physically largest woodwind instruments around. The range is down to low concert Db, an octave below the baritone sax. Two octaves below the alto. This may not be as low as the BBb contrabass sarussophone, or the contrabassoon, but with the wide saxophone bore, this beast must surely outweigh them. 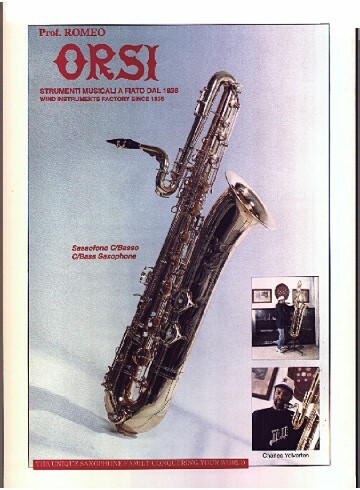 Paul Cohen, noted musician, instrument collector, and columnist for the Saxophone Journal, thinks that there are about 15 of the old originals still in existence, worldwide (not counting the model now in production by Orsi/LA Sax, or the Eb contrabass tubax by Benedikt Eppelsheim). He plays a vintage Buffet, and can be heard on his CD "Vintage Saxophones Revisited." Evette made about 25 contras, between 1900 and 1925, of which 8 or 9 are believed still "alive." The remaining horns were made by Kohlert and Orsi. C.G. Conn used to make EEb contrabass sarussophones , which they sold in lieu of the contrabass sax, probably because they were more portable. Contrabass saxophones are once again in production! Thanks to a joint venture between LA Sax and ORSI (Milan, Italy), contrabass saxes are rumbling around the world in ever-increasing numbers. This joint venture is also responsible for the bass and sopranino saxophones now sold by LASax. I had a chance to visit the ORSI factory in Milan in January 1998. All instruments there are hand crafted: brass is drawn and formed the old-fashioned way (with lead), resulting in metal of a constant thickness (and good resonance). LA Sax is organizing "appearances" for interested players to try out the contra (details on their web page). The contrabass sax is the lowest real saxophone ever built. Sax's French patent (#3226) apparently describes a subcontrabass (bourdon) saxophone in C or Bb, an octave below the bass saxophone. Unfortunately, as far as I can determine, none were ever built. For the others, see Subcontrabass Saxophones. There is, however, a new Bb subcontrabass tubax - probably the closest we'll ever get to a real subcontrabass sax. Adolphe Sax, the inventor, must have been known for his own contrabass mania, having improved the bass clarinet, invented saxophones down to the mighty contrabass (and apparently designed a few lower still), and the bass and contrabass saxhorns. A number of editorial cartoons from his day attest to the public's perception of him... You can find recordings employing the contrabass sax by Anthony Braxton, the Nuclear Whales (also at their own site ), Paul Cohen's "Vintage Saxophones Revisited", Thomas Mejer, Scott Robinson, Daniel Kientzy, and the Sigurd Rascher Saxophone Ensemble. Peter Koval has one, currently for sale . OK, that's eight of them: does anyone know where the others went? Special thanks to Paul Cohen for his information, and his audio demonstration of the contrabass sax! Paul has graciously provided a recording with several selections that include the contrabass sax. The first piece on the tape is a recording of Cowell's "Hymn andFuguing Tune #18" from his CD "Vintage Saxophones Revisited". This piece is a duet between contrabass sax and soprano sax. A longer clip from the first part of the piece (which includes the short clip). This is fairly chorale-like. About 28 seconds: (WAV ,2.4 MB) (mp3 ). A clip from the second part of the piece. Its has some of the quick fugue sections. The clip is about 21 seconds: ( WAV , 1.8 MB)(mp3 ). The tape also includes "Rocked in the Cradle of the Deep" on bass saxophone, and two marches arranged for saxophone choir (contrabass to sopranino). The marches (if memory serves) are The Liberty Bell (immediately recognizable to all Monty Python fans) and the Stars and Stripes Forever. Jay Easton check out the new Bb subcontrabass tubax!